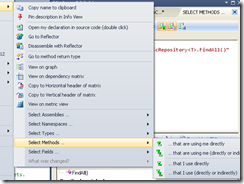 In a large Visual Studio solution, there are better ways of finding a particular class or method than visually hunting through the solution explorer tree. Good old Goto Definition (F12) is great. To quickly go back to where you pressed F12, Control - (minus) is useful but not very well known. 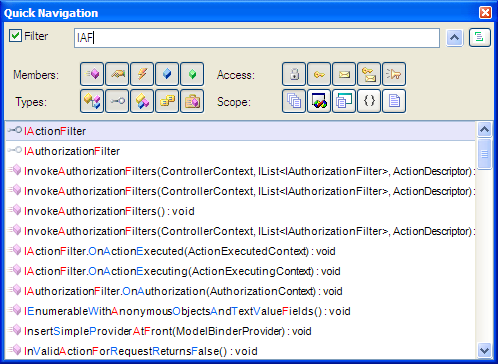 But what if you want to find where an interface is implemented, a method overridden or called from elsewhere? Find All References (Control K, R) is painfully slow and it dumps everything in the Find Symbol Results window with the full file path (you can hack the registry to fix the format, but still...). 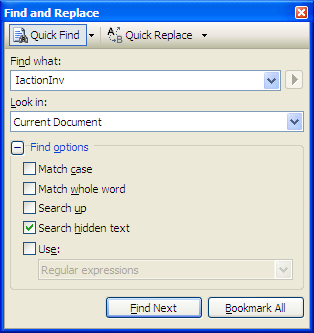 Within a source file, incremental search (Control I) is a great hidden secret - no dialog box, just start type and it immediately jumps to the first match. It has a big flaw: it doesn't look in hidden sections (closed regions). To find a class or method which isn't in the source in front of you, you use Quick Find (Control F) or Find In Finds (Control Shift F). It's slow, and opens in a docked Find window. All those docked windows quickly become confusing. 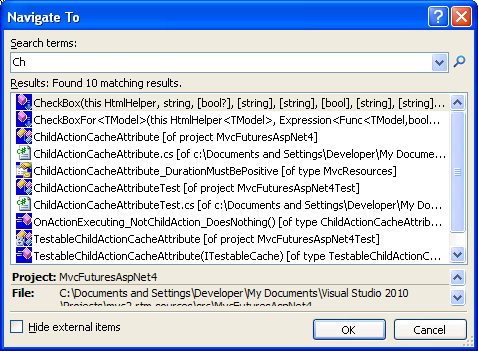 VS 2010 still has Slowly Find All References, but it now has a couple of extra goodies. View Call Hierarchy (Control K, T) has a nice graph of calls to/ calls from which is recursive. In other words, just like Reflector's Analyzer. There's a neat new Navigate To window (Control comma). 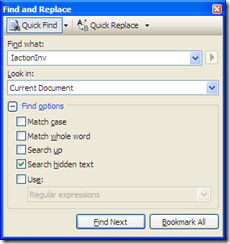 It's not a docked window, and has a really cool incremental search of the solution. 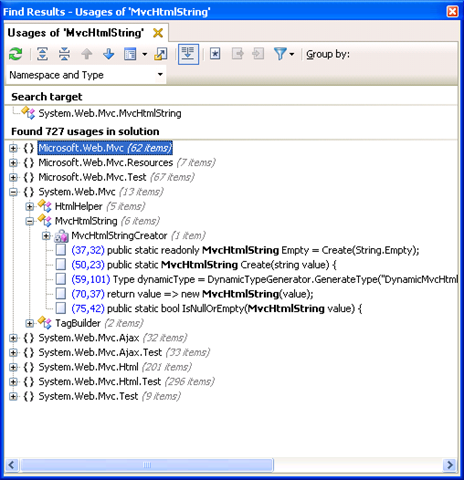 The search box allows camel hump searching (just the capitals), as well as sub-strings. 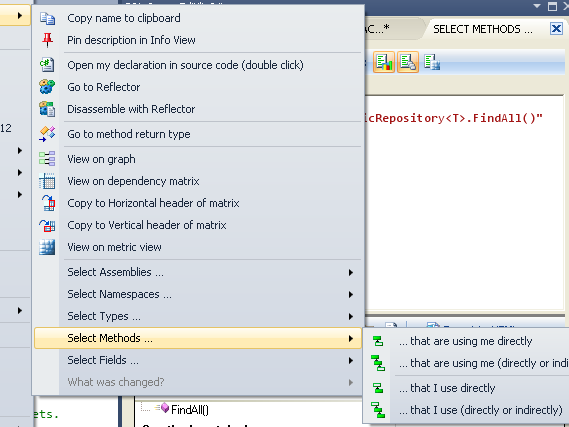 If you're using Coderush Pro, you've had a nice version of call hierarchy in VS 2005 and 2008- it's the References window. There's a live-sync mode (overkill really), or you update it with Shift-F12 (or use the Refresh button). 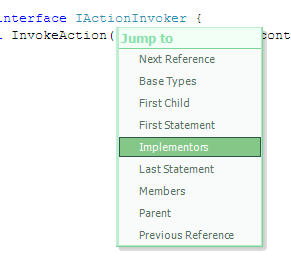 Also in Coderush, the jump to... context menu also shows context-sensitive overrides/ implementations and the next/prev reference can be tabbed to within a file (VS 2010 catches up with some features of this by highlighting other uses of a variable when the caret is on it). 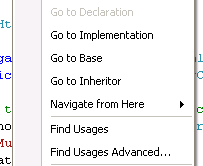 My favourite feature of Coderush (and the free version, Coderush Xpress) is the Quick Nav dialog (Control Shift Q), which VS2010's Navigate To emulates. 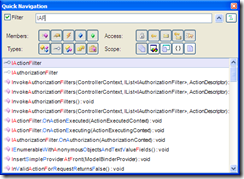 Quick incremental search, with camel-humps and substrings, and filter by members. Resharper also has an equivalent of QuickNav/NavigateTo, with all the camel humps goodness (no substrings, but you can do * and ? wildcards). 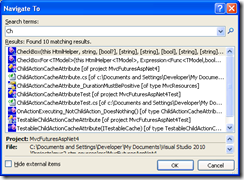 (Note that Resharper has two keyboard mappings; I'm using the Visual Studio mappings here). 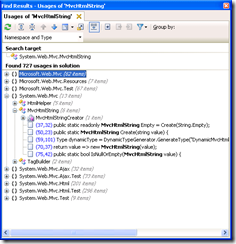 Find Symbol - Shift Alt T - finds types and type members. Find Type - Control T - just looks at types. 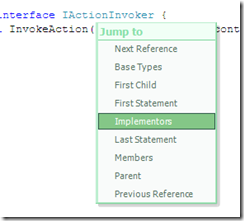 The right-click context menus for implementors, base and especially usages very handy. You can get to Find Usages with Shift-F12. 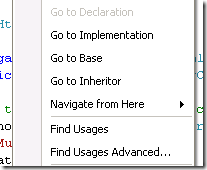 If there's only one usage (or base or inheritor), you go straight to it. The reason that Coderush and Resharper can do the quick navigation is that they parse the solution, so for the first minute or so a large solution will show one of their processing messages (theoretically you can type away, but things are slow while they are working).